Businesses are increasingly dealing with a new type of risk that carries new threats to their reputation and bottom line: controversial social issues. Such crises often center on hot-button topics like social injustice, immigration, gun control and trade wars. While speaking out may bring significant risk to an organization, staying silent may not be an option or may present a different and even greater set of risks. For example, a 2018 Glassdoor survey found that 60% of employees actually expect their employer to take a stand on important social and political issues. If your company decides to do so, it must be ready for jeers as well as cheers from employees, board members, customers, partners and shareholders. Recently, Nike took a stand in the National Football League’s “taking a knee” controversy by hiring former NFL quarterback Colin Kaepernick to be the face of an advertising campaign celebrating the 30th anniversary of its “Just Do It” slogan. Public reaction was swift: heated negative sentiment led to some consumers posting videos of themselves burning their Nike products and the company’s stock dropped 3%. There was considerable positive response as well, however. Within a few days, Nike products were flying off shelves with a 31% jump in online sales. After the initial drop, Nike’s stock started climbing, reaching a record high 16 days after the ad debuted. Reportedly, Nike’s market value increased by $6 billion in the weeks following the release of the Kaepernick ad. Nike was clearly prepared when it decided to take this stand on a social issue. But that preparation and proactive approach is unfortunately not the norm. In interviews conducted by communications and marketing firm Peppercomm with more than 50 C-suite executives, two-thirds said their company was not prepared should they find themselves caught in the cross-hairs of a social controversy. An organization’s purpose should be the first and foremost consideration in preparing to respond to a controversy or political debate. Based on the values your organization holds dear, purpose is why employees come to work each day and, in times of crisis, your corporate purpose is your North Star, helping to guide your company through any difficulty. A clearly articulated purpose that is authentic and well understood by both employees and customers/prospects is essential to mitigate risk. Even stakeholders who do not agree with your stand (or even your decision to take a stand), cannot fault you for staying true to your purpose. Nike has frequently celebrated that their customers are individuals who may have strong beliefs or goals, follow their convictions and “just do it.” As a result, the new campaign is authentic and plays to both the brand’s identity as well as their audience’s. Yes, they may have lost some customers. But they likely gained even more new ones or reinvigorated existing ones. How well do you know your stakeholders? How is each likely to react? It is critical to know what you may be dealing with in terms of both potential fallout and reward when deciding whether to take a public stand on an issue. Make sure in-depth research is conducted in advance so you are not blindsided by risks you failed to account for. This takes a dynamic partnership among risk management and communications, marketing and HR teams. Risk managers clearly understand the importance of monitoring issues that could create risk for the company. Companies should invest in monitoring tools to help track, in real time, topics that are quickly gaining ground and prepare for related top stories or trending social media debates. Smart analysis of data in advance empowers you to manage risk and map out an informed strategy. Adding social issues to your risk management portfolio requires a specialized audit addressing a new set of vulnerabilities, communications messages and materials, social media channels, and partnerships and sponsorships. For example, if you take a stand on an issue and a long-term partner has a well-known opposing stand, you risk having your employees, customers and the public at large call you out for hypocrisy and inauthentic behavior, even if they agree with your stance on the issue. It can truly be a tightrope walk. When you and your fellow executives are confident about taking a stand on a particular social issue or crisis, stress-test it with an in-house simulation as you would for other crisis scenarios. Depending on the nature of the issue, your social risk simulation should include a number of new players beyond the regular C-suite and risk management committee—employee resource groups, plant-level employees, customers, distributors, lobbyists, communications and advertising agencies. This can be key to identify and prepare for the new set of risks that are emerging in today’s politically and socially charged environment. 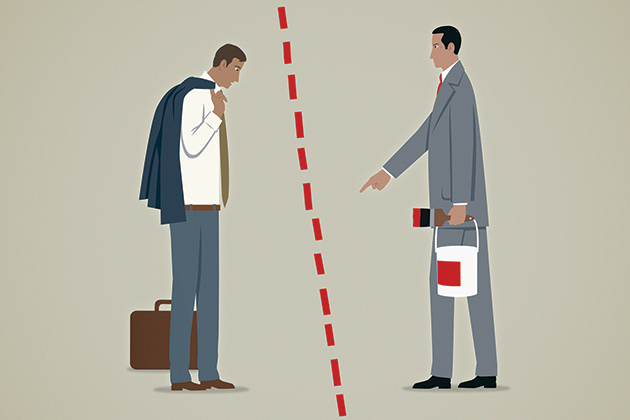 Taking a stand on a controversial issue is certainly not without risks for your organization. Not taking a stand when your employees and stakeholders expect it is also risky. Following these guidelines for advance preparation can help determine whether your company’s business and reputation are best served by taking a stand or standing down on a particular issue. The time-honored risk-mitigation adage comes to mind: failing to plan is the equivalent of planning to fail.